View all products by Nosh & Co. 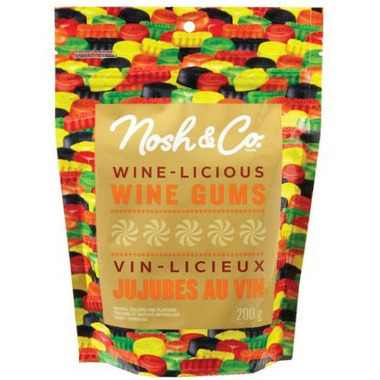 The Nosh & Co. Wine-licious Wine Gums are made with all natural flavours and colours. Enjoy raspberry, lemon, lime, orange, and blackcurrant! 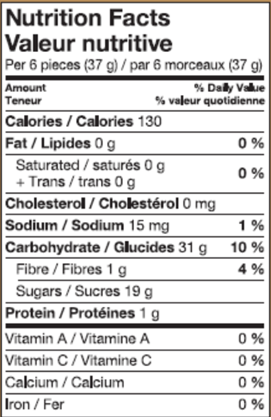 Ingredients: Glucose syrup (contains wheat), sugar, modified corn starch, water, potato starch, gelatin, lactic acid, acetic acid, natural flavours (raspberry, lemon, lime, orange, blackcurrant), natural colours (anthocyanins, paprika, curcumin), palm kernel, sunflower and coconut oil, vegetable concentrates (nettle and spinach), beeswax. These were just OK. Kind of tough and flavours kind of blah!